With this, the second article from the March 2006 issue of "Fenghuang Weekly", we obtain a rare glimpse into the world of baby trafficking. As we saw from our first article, the stage was set in Hunan Province. The director of the Hengyang County orphanage had put word out that the orphanage was buying babies. It was only a matter of time before someone heard of Ms. Liang, an elderly woman in Wuchuan City, Guangdong Province. These articles were translated from the Chinese by a professional translator at LanguageScape.com. The words are not mine; the mistakes are not mine; as much as I would like to make corrections (like the stated date that international adoptions began in the first segment), I have left them. In 2001, in Wuchuan City of Guangdong Province, the husband of Duan Meilin discovered an older woman surnamed Xing that had taken care of, and brought up, a great deal of abandoned children. Through this discovery the Duan family would soon be drawn into the business of selling babies. Since then, the number of babies that the family has played a part in the trafficking of is difficult to estimate. For this, the Duan family is doomed to be a family that people will talk about for many years to come. On February 22nd 2006, Duan Meilin, her sister Duan Zilin, her brother Duan Yueneng, his wife Wu Daichao, her own sister Wu Daiqun, and the youngest sister of her sister's husband Zhang Chunai all stood in the place of the accused at Qidong's People's court. In 2001, Duan Meilin's husband Zhang Mou was working at a chicken farm in Wuchuan of Guangdong province. One day he happened to find out that a woman with the surname of Liang that worked there had raised a lot of abandoned little girls. This discovery made Zhang excited beyond words. In Wuchuan of Guangdong Province's southwest, the concept that boys and men are more important than females is still very prevalent, and so the abandonment of girl infants is certainly not big news. One bit of evidence comes from the diary of a student gaining practical experience in a related office: "Today, I sorted out the 'public notarization book of abandoned infant's' (finding ads). My god! There are so many. It has thirty or forty separate parts! These little girls were abandoned in every corner of Wuchuan. If they weren't soon brought over to the welfare center by some good-hearted person, their lives would still be in the hands of fate." The old Ms. Liang had, with the help of several other older women, raised a very large number of abandoned girls over the more than ten years that she had been in the business. Some couples looking to adopt a child would go to her home and select the children they liked. Generally speaking these couples would give Ms. Liang and the other women some kind of remuneration for their services. Others that needed some way to deal with or dispose of baby girls would also come to their door. At the most, Liang would keep around forty babies in the house. The mother of Duan Meilin, Chen Yejin, had previously worked at a welfare center in Hunan’s Changning city. From that experience she knew that just sending a baby to a welfare center could earn a person more than 1000 yuan. Bearing this in mind, Duan Meilin and her sister Duan Zilin started to look for abandoned babies in the Changning area. When Zhang Mou found out that Miss. Liang had a lot of babies at her house the whole Duan family became wild with joy. They thought that they had stumbled upon an excellent money-making opportunity. Duan Meilin then accompanied Zhang to the Wu household in Wuchuan, and adopted one of the children. After returning home, Duan Meilin passed the child onto the welfare center in Changning and was paid 2300 yuan for the child. In 2002, Duan Meilin returned to the home of Miss. Liang, this time with her sister and mother. After paying Ms. Liang 720 yuan, they chose six baby girls and placed them in a paper box to carry them home. On the train back home the railway police discovered the six babies stored in a paper box. They quickly decided the babies must have been kidnapped, so the children were sent to the welfare center of Liuzhou. Duan Meilin along with her sister and mother were put into custody before being set free one month later. 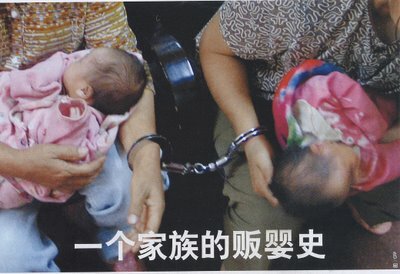 The same year the mother and daughters of the Duan family sold three infants to the welfare center of Zhuzhou City in Hunan province, capturing 6900 yuan, but as soon as they exited the building the Zhuzhou police seized them. The Hunan Provincial police immediately went to Wuchuan for further investigation. Upon learning about Ms. Liang the Wuchuan City Welfare Center went to her house and took the children away. In 2003 sisters and brothers of the Duan family were again taken into custody by the Changning City police before again being released. After helping the brothers and sisters to get to know a lot of those in charge of the management of various welfare centers in Hengyang, Duan's mother Chen Yejin withdrew from the business of buying and selling children. The other members of the Duan family then began working on their own. About a year later, Duan Meilin and Zhang Mou returned to the home of Ms. Liang. Ms. Liang knew that they had been seized by the police, so she did not want to be involved with them anymore. Zhang explained to her that the police had determined that they had not been kidnapping children and therefore let them free, "otherwise, we would be facing punishment." Duan then said that the Hengyang Welfare Center wanted infants. "It doesn't matter how many. They will take them all, no problem." One of those babies taken from Ms. Liang's home had been ill, but Duan Meilin said that she was beautiful and after paying fifty yuan for the baby insisted on taking her. As a result the baby died on the road. Later in court, Miss. Liang would argue defensively that she sold this sick baby because she believed that the welfare center could save the child's life, since she had no way to offer the little girl treatment. Over the past fourteen years of all the infants that Ms. Liang had raised, fourteen had died from illness. Ms. Liang's idea was that by raising these children she could make extra money to supplement her otherwise meager budget. In court she admitted that she had earned more that 60,000 yuan buying and selling these children. Of this money, she said 20,000 had been used to treat her daughter's mental illness; 20,000 had been used to treat her own illness; and something more than 10,000 had been used to pay for her son’s college education. As Guangdong's planned birth policy became more and more stringent the number of people that had children outside of the plan decreased, and so abandoned babies became fewer and fewer. In order to get more of this smaller number of infants, Ms. Liang then began to pay varying amounts between 100 and 1000 yuan for them. Ms. Liang's son from college then began to help out in the management of the business of buying and selling infants. At this time, the sister of a supervisor at the Hengyang county welfare agency, after discovering the Duan family's "source of merchandise", took four or five other ladies to Wuchuan, and straightaway opened discussions with Ms. Liang and son, and took up the infant peddling trade in competition with the Duan family. In 2003 the going price of a baby there was still in the hundreds of yuan. By 2004 the price had risen to more than 2000 yuan, and by the second half of 2005 the price had climbed to about 3500. At the end of 2004 several cadres from the Qidong county welfare center made a special trip down to Changning. Once there they tracked down Duan Meilin and asked her to provide them with more infants. For help in doing this Duan Meilin then asked her sister-in law, Wu Daochao to help her. Wu Daichao and her husband DuanYueneng then rented out a house close to the home of Ms. Liang in Wuchuan and prepared to go into business for the long-term. That year Duan Meilin was able to get at least forty children from the home of Ms. Liang. After Wu Daichao became familiar with the whole buying and selling process, she called upon her sister, Wu Daiqun, who was then working in Guangdong. For every infant that Wu Daoqun was able to procure for her sister she was given 300 yuan and for a pair 500 yuan. In Wuchuan, Wu Daochao came to know a woman that had brought a baby to Ms. Liang. Named Wu Guande, the old woman had often served as a mid-wife. Wu Daochao also became familiar with a driver named Mr. Liu. This group of well-informed sources soon became the life-wire of Wu Daochao's business. In court, Ms. Liang said that she found out that an older man that sells cool tea was also involved in collecting infants. She also knew that other Duan brothers and sisters had been involved in transactions totaling more than forty. In July of 2005, Duan Meilin, worried that by transporting more than two infants back to Hunan she might draw the attention of authorities, once again hired her sister Zhang Chunai for help, paying her 500 yuan a month. As word about the Duan family's operations in the city of Wuchuan spread, more and more people came to them to talk business. Usually these people would earn somewhat more than 2000 yuan for the children they brought. When her business was good, Duan Meilin could herself sell around ten infants per month. Over the years hundreds of infants were sold in this way. During the afternoon of November 17th 2005, Duan Yueneng once again went to the home of old Ms. Liang. When he saw that Liang had three more infants in her household he immediately called the Hengyang County Welfare Center. After both sides had settled on an agreement, Duan Yueneng got his wife Wu Daichao and her sister to come to purchase all three babies and take them to Hengyang with him that same night. During the afternoon of the next day among those that came to meet the brothers and sisters of the Wu family were employees of the Hengyang welfare agency as well as the Qidong County police, who had long been lying low until that opportune moment. This, then, was the last sale of the Duan family infant peddling. "It is well-known that three Provinces provide a majority of the children adopted through the IA program -- Guangdong, Jiangxi and Hunan." never heard of this "well-known"
The other provinces (Anhui, Yunnan, Shaanxi, Shanxi, Henan, Fujian, Jiangsu, etc.) fall below the levels of Hubei. the last ten or more years? I find k's comments both amusing and annoying. He/she seems to be nit-picking to find anyway to discredit you. Makes me wonder why he/she reads this blog at all. Hi Brian, my agency is saying that referrals may include 8/23/05. But that they are not expecting it to go any further. Of course they also put a disclaimer in there that they really have no way to tell until they come. Do you think this will be the new norm, 15 days worth of referrals ever month? I don't pretend to know anything of the day-to-day activities of the CCAA, how they operate, or when they will issue referrals. I try to look at the forces behind the program itself. For example, I see the statements of the CCAA not having enough "paper-ready" children as a reflection of a reality that includes orphanages having no healthy infants to submit paperwork for. I try to avoid convoluted interpretations that assign meaning that has no supporting evidence, such as that directors are being more thorough in their paperwork submissions, which has created bottlenecks. There simply is no evidence to support that conclusion. I would expect the number of referrals to increase in coming months, but have no way of knowing when cut-offs will occur, etc. New orphanages are added regularly. For example, although adoptions have obviously been going on in Guangdong Province since the inception of the program, the Leizhou orphanage began processing international adoptions in December 2003, with the first babies being referred in mid-2004. This is also the case with the Suixi orphanage, which now provides a substantial portion of the children referred from Guangdong, but entered the program in 2003. Conversely, orphanages in Guangdong that used to provide many children have in recent years seen a substantial decline in referrals -- Wuchuan, Maoming, Huazhou and others. This pattern is seen all over. Inner Mongolia is seeing an increase in referrals, as are orphanages in Gansu Province to take another example. Before mid-2004, there was no city-specific Yahoogroup for any city in Gansu, but now there are five groups boasting nearly 250 families. I often wish I had the time to graph the adoption rates for each orphanage to see which ones have seen the biggest declines. I started my adoption experiences in 1998, so have no first-hand experience from before that time. Sorry!! hi brian, i am hoping to hear more about your projections on future adoptions. i am dtc march 29th....what do you think will i be bringing home a baby this summer???? I adopted my daughter from the Wuchuan Welfare Center in 1997. These comments distress me greatly although they are after our adoption date. My original assigned baby was not given to me and was substituted - why? My daughter is absolutely the one for me and we were meant to be family -the red string is strong - but I think about the child left behind - as well as all the other children - these stories of child selling, trafficking, etc. are most distressing - what kind of society allows this? A mom from Los Angeles.